Be sure to consult the online InterSystems Supported Platforms document for this release for information on system requirements for InterSystems IRIS Business Intelligence. You can access the Analyzer from the InterSystems launcher or from the InterSystems User Portal; for information on the Portal, see the Using Dashboards and the User Portal. The Analyzer enables you to create pivot tables, which display aggregated data. Each pivot table is based upon a subject area or a cube. (In the Analyzer, the terms subject area and cube are equivalent to each other; this book uses the term subject area.) When you access the Analyzer, you must choose the subject area to work with. The Analyzer then displays the elements defined in that subject area, which you drag and drop to create pivot tables. Pivot tables are central to InterSystems Business Intelligence; they select and aggregate data. The following figure shows an example pivot table that shows the number of patients and the average allergy count per patient, grouped by age and gender. A level is used to group the source data. A level has members. Each member, in turn, corresponds to a specific set of records in the source data. For example, the Age Group level has the members 0-29, 30-39, and 60+. The Gender level has the members Female and Male. A measure is a value displayed in the body of the pivot table; it is based on values in the source data. For a given context, a measure aggregates the values for all applicable source records and represents them with a single value. For example, the measure Patient Count is the number of patients, and the measure Avg Allergy Count is the average number of allergies per patient. The preceding example shows a preview of a pivot table within the Analyzer, which provides a large set of tools for modifying the pivot table, exporting to Microsoft Excel, toggling to a chart format, and so on. Depending on your security, you may be prompted to log in with an InterSystems IRIS™ username and password. Click the < button at the left side of the User Portal, click Add, and then click Add Pivot. Click the name of a pivot table in the User Portal. This opens that pivot table in edit mode, within the Analyzer. To access the Mini Analyzer, you must first display a suitable dashboard. Not all dashboards provide access to the Mini Analyzer. If a dashboard displays the Mini Analyzer button in a widget, click that button, and the system then opens the current pivot table in the Mini Analyzer. The Mini Analyzer includes only the options that let you make local changes to the pivot table as displayed in this widget. The changes do not affect other widgets, other dashboards, or other users. Menu  This drop-down menu provides options to open and save pivot tables. Home  This link accesses the User Portal. Analytics  This link accesses other Analytics tools. Analyzer  This link redisplays the Analyzer. This is useful if there have been changes to the definition of the subject area. Switch  This link (next to the namespace name) lets you switch to another InterSystems IRIS namespace. View  These buttons switch the pivot table display to a chart format or to a table-and-chart format. New  This button lets you create a new pivot table. Open, Save, and Save As  These buttons let you open and save pivot tables. Delete  This button lets you delete the current pivot table. Auto-execute  This check box lets you control whether the system automatically executes the pivot table. Preview Mode  This check box enables Preview Mode. If Preview Mode is enabled, any sets involved in a CROSSJOIN are truncated using the HEAD function. If truncation occurs, a preview pivot table is displayed in the Analyzer. You can use the Show All button to display full results without affecting the Preview Mode setting. actions  This drop-down list lets you perform actions. This is included only if the cube defines actions. Note that when you invoke actions this way, Business Intelligence supports only a subset of the only client-side commands; other client-side commands are ignored. For details, see the Implementing InterSystems Business Intelligence. 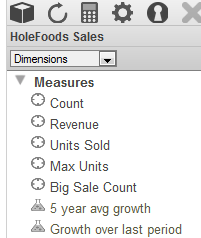 The title below Menu displays the name of the currently selected subject area (which is HoleFoods Sales in this case) or the pivot table that you currently editing, if any. The rest of the page is visible in both the Analyzer and the Mini Analyzer. The following subsections discuss the Model Contents pane, the Pivot Builder area, and the Pivot Preview area. The final subsection discusses how the Mini Analyzer is different from the full Analyzer. This area lists the contents of the subject area that you are currently viewing. The next chapter discusses this area in more detail. During development, you may find it necessary to reload the model, if you have made changes in the Architect or Studio. To reload the model, click the Refresh button in this area. Note that this button does not rerun the pivot table; it affects only the model as shown in this area. You can resize this area. To do so, drag the vertical divider on the right edge of this area. You can resize this area. To do so, drag the horizontal divider on the bottom edge of this area. You can also resize the four boxes shown in this area; to do so, drag the divider between boxes. The Cells number displays the number of cells that are currently selected (or the total number of cells on the page if there is no selection). The Total number displays the total value of all the selected cells (or of all the cells on the page if there is no selection). If there is too much data to display on the screen, the lower right corner displays buttons that you can use to page through the results. You can resize this area. To do so, drag the horizontal divider on the top edge of this area. The Mini Analyzer does not provide options that enable you to create a new pivot table. That is, you can only make changes to the currently displayed pivot table. The changes are visible only to yourself. Other users are unaffected. For information on accessing the Mini Analyzer, see the previous topic. Click Open, expand folders as needed, select a pivot table, and click OK. Select Pivots in the Model Contents area. Then expand folders as needed and select a pivot table. In most cases, the system immediately runs the query defined by the pivot table and then displays the results. If the Auto-execute option is off, however, the system does not do so. In such cases, click the Refresh button in the Pivot Builder area. The system then runs the query and displays the table. To exit the Analyzer and return to the User Portal, click Home. Any unsaved changes are discarded. To exit the Mini Analyzer and return to the dashboard from which you started, click either OK or Cancel. The OK option saves your changes, and the Cancel option discards them. Or click Reset to remove any changes created in the Mini Analyzer, and then click OK.
A pivot table definition is not a class definition but can be copied and pasted into a special container class if needed; this container class can contain multiple pivot tables and other items. For details, see “Packaging Business Intelligence Elements into Classes” in Implementing InterSystems Business Intelligence. Most of the samples in this book are part of the Samples-BI sample (https://github.com/intersystems/Samples-BI) or the Samples-Aviation sample (https://github.com/intersystems/Samples-Aviation). InterSystems recommends that you create a dedicated namespace called SAMPLES (for example) and load samples into that namespace. For the general process, see Downloading Samples for Use with InterSystems IRIS.